"Fresh and large scallops stew in a marinade of tangy Cuban 'mojito.' 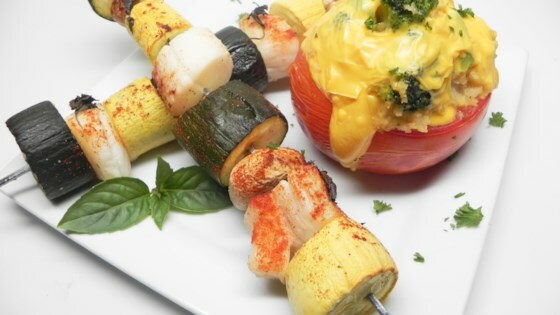 Two large scallops meet chunks of yellow squash, zucchini, and portabello mushrooms on a stick to form a kabob. It's sure to take you away to the tropics in the middle of your work week. Serve with a baked and stuffed broccoli-cheese tomato." Whisk orange juice, lemon juice, salt, onion powder, garlic powder, black pepper, and sugar together in a large bowl to dissolve seasoning into the liquid. Add scallops, yellow squash, zucchinis, and portobello mushroom to the mojito marinade; toss to coat. Thread onto a skewer a piece of mushroom, yellow squash, zucchini, and a scallop, respectively. Repeat so there are two of each item on the skewer; repeat with remaining skewers. Sprinkle fresh basil evenly over the skewers. Carefully remove tomato insides with a spoon; discard tomato insides. Pour broccoli with cheese sauce into a microwave-safe bowl; cook in microwave until broccoli is tender and the sauce is melted, 3 to 5 minutes. Stir broccoli with cheese sauce and rice together in a bowl; spoon into the hollowed-out tomatoes. Place 2 strips American cheese atop the mixture in a crossing pattern. Cook the skewers in preheated oven until the scallops are cooked through, 25 to 30 minutes. Remove from oven to a plate; cover with aluminum foil to keep warm. Bake tomatoes in the oven until the cheese is bubbling, 5 to 10 minutes. Serve with the skewers. Only let sit for less than an hour, and it was delicious.